For a timeless look and elegant style, you can't go wrong with a black diamond solitaire. 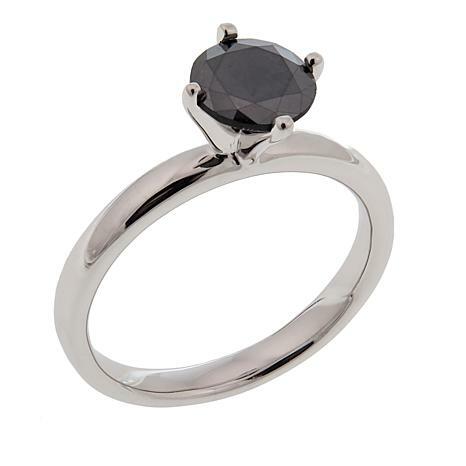 This beautiful ring features a stunning hand-cut, round black diamond atop a slender silver band. It's a singular statement piece as unique as the woman who wears it! I purchased this ring with the intention of placing the diamond in another setting. 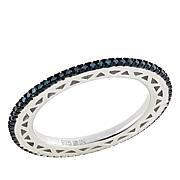 The ring is absolutely gorgeous.Black diamonds do naturally occur, but this one is enhanced. I was not expecting a VS clarity for a diamond that was only $200. It is exactly what I was expecting. LOVE IT! I returned one and took a chance on another. Very glad I did. This one is a keeper! It's shiny, has depth, is reflective, everything a diamond should be. If you are silly enough to expect a SI1 perfect diamond for this price you may be disappointed. If you want a really nice diamond ring for a crazy price, this is your ring!! I love mine. Absolutely a beautiful elegant statement. Sparkles and there's no doubt it anything but the real deal! Have been wearing it for a few weeks and it's perfect in every way. I never take it off. It's my everyday luxury! 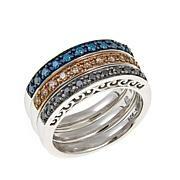 Thanks HSN for making a diamond ring so elegant and affordable. I was very taken with this ring, because of its simple elegance, which is my taste. I haven't worn it yet, but It has joined my jewlery collection and looks very well there. Because the stone is elevated, I will wear it on occasions rather than everyday, but still a beautiful design. 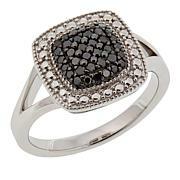 Beautiful black diamond set in a great silver band very well made looks amazing on finger!